The Best Weight Loss Friendly Peanut Butter Cookies! 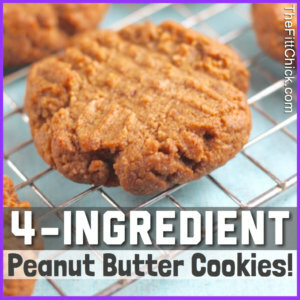 TheFittChick 4-ingredient Peanut Butter Cookies! 2. Add all the ingredients to a medium sized bowl and mix them all together until they are well combined. 3. Roll the dough into 1-inch balls using a scoop or your hands. 4. Place the balls of dough on a cookie sheet lined with parchment paper or a silicone baking mat. 5. Press down on each ball with a fork twice in opposite directions creating a criss-cross pattern on each cookie! 6. You will bake these cookies for about 12 to 15 minutes or until golden brown.